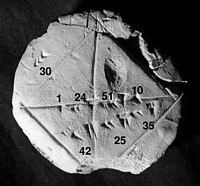 In this article, all sexagesimal digits are represented as decimal numbers, except where otherwise noted. For example, 10 means the number ten and 60 means the number sixty. It is possible for people to count on their fingers to 12 using one hand only, with the thumb pointing to each finger bone on the four fingers in turn. A traditional counting system still in use in many regions of Asia works in this way, and could help to explain the occurrence of numeral systems based on 12 and 60 besides those based on 10, 20 and 5. In this system, one hand counts repeatedly to 12, displaying the number of iterations on the other, until five dozens, i. e. the 60, are full.
) to represent zero, but only in the medial positions, and not on the right-hand side of the number, as we do in numbers like 7004132000000000000♠13200. Ptolemy's Almagest, a treatise on mathematical astronomy written in the second century AD, uses base 60 to express the fractional parts of numbers. In particular, his table of chords, which was essentially the only extensive trigonometric table for more than a millennium, has fractional parts of a degree in base 60. Medieval astronomers also used sexagesimal numbers to note time. Around 1235 John of Sacrobosco discussed the length of the tropical year using sexagesimal divisions of the hour, in what may be the earliest division of the hour into minutes and seconds. The Parisian version of the Alfonsine tables (ca. 1320) used the day as the basic unit of time, recording multiples and fractions of a day in base 60 notation. In version 1.1 of the YAML data storage format, sexagesimals are supported for plain scalars, and formally specified both for integers and floating point numbers. This has led to confusion, as e.g. some MAC addresses would be recognised as sexagesimals and loaded as integers, where others were not and loaded as strings. In YAML 1.2 support for sexagesimals was dropped. The length of the tropical year in Babylonian astronomy (see Hipparchus), 7002365245790000000♠365.24579... days, can be expressed in sexagesimal as 6,5;14,44,51 (6 × 60 + 5 + 14/60 + 44/602 + 51/603) days. The average length of a year in the Gregorian calendar is exactly 6,5;14,33 in the same notation because the values 14 and 33 were the first two values for the tropical year from the Alfonsine tables, which were in sexagesimal notation. ^ Ifrah, Georges (2000), The Universal History of Numbers: From prehistory to the invention of the computer., John Wiley and Sons, ISBN 0-471-39340-1 . Translated from the French by David Bellos, E.F. Harding, Sophie Wood and Ian Monk. ^ Bello, Ignacio; Britton, Jack R.; Kaul, Anton (2009), Topics in Contemporary Mathematics (9th ed. ), Cengage Learning, p. 182, ISBN 9780538737791 . ^ Nothaft, C. Philipp E. (2018), Scandalous Error: Calendar Reform and Calendrical Astronomy in Medieval Europe, Oxford: Oxford University Press, p. 126, ISBN 9780198799559, Sacrobosco switched to sexagesimal fractions, but rendered them more congenial to computistical use by applying them not to the day but to the hour, thereby inaugurating the use of hours, minutes, and seconds that still prevails in the twenty-first century. ^ Nothaft, C. Philipp E. (2018), Scandalous Error: Calendar Reform and Calendrical Astronomy in Medieval Europe, Oxford: Oxford University Press, p. 196, ISBN 9780198799559, One noteworthy feature of the Alfonsine Tables in their Latin-Parisian incarnation is the strict 'sexagesimalization' of all tabulated parameters, as … motions and time intervals were consistently dissolved into base-60 multiples and fractions of days or degrees. ^ Newton, Isaac (1671), The Method of Fluxions and Infinite Series: With Its Application to the Geometry of Curve-lines., London: Henry Woodfall (published 1736), p. 146, The most remarkable of these is the Sexagenary or Sexagesimal Scale of Arithmetick, of frequent use among Astronomers, which expresses all possible Numbers, Integers or Fractions, Rational or Surd, by the Powers of Sixty, and certain numeral Coefficients not exceeding fifty-nine. ^ Lean, Glendon Angove (1992), Counting Systems of Papua New Guinea and Oceania, Ph.D. thesis, Papua New Guinea University of Technology, archived from the original on 2007-09-05 . See especially chapter 4 Archived 2007-09-28 at the Wayback Machine. ^ Oren Ben-Kiki; Clark Evans; Brian Ingerson (2009-10-01). "YAML Ain't Markup Language (YAML™) Version 1.2 (3rd Edition, Patched at 2009-10-01) §10.3.2 Tag Resolution". The Official YAML Web Site. Retrieved 2019-01-30. ^ Youschkevitch, Adolf P., "Al-Kashi", in Rosenfeld, Boris A. (ed. ), Dictionary of Scientific Biography, p. 256 .